This is a survey of the postage stamps and postal history of Serbia. The Principality of Serbia (Kingdom in 1881) began to issue its own stamps in 1866. This continued until 1920, when its postal system was merged with the postal system of the former Austro-Hungarian territories with which it formed the Kingdom of Serbs, Croats and Slovenes. After the Germans established the Government of National Salvation in 1941 it issued its own stamps until 1944. Initially, Yugoslavian stamps were simply overprinted in German with the word Serbien. Later regular issues were inscribed both Serbien and Србија (Serbia). From 1944 onwards, Serbia was again part of Yugoslavia. Upon the dissolution of the union of Serbia and Montenegro in 2006, Serbia began issuing its own stamps once more. The Post of Serbia issues the country's stamps. Derocco, E. Istorija poštanskih maraka Srbije = History of the postage stamps of Serbia. 1973, 98p. Fleck, Vladimir. Die Briefmarken von Serbien. Frankfurt am Main: [Arbeitsgemeinschaft Neues Handbuch der Briefmarkenkunde], 1965, 31p. Kardosch, Velizar M. The Principality of Serbia : postal history and postage stamps, 1830-1882. Romanshorn: V.M. Kardosch, 1996 ISBN 395-210-831-6, 381p. Rasic, Mirko R. The Postal History and Postage Stamps of Serbia. New York? : Pub. by The Theodore E. Steinway Memorial Publication Fund, 1979, 276p. Rodgers, E. W. The Serbian Stamp of Death. Brantford, Ont. : Canadian Wholesale Supply, 1977, 20p. Smeth, Paul de. Les Timbres de La Principauté de Serbie (1866 à 1880). Amiens: Yvert, 1927, 54p. Walshe, M. O'C. The Obrenovich Stamps of Serbia (1866-1904). London: Published by "Stamp Collecting," at the Vallancy Press, Ltd., 1929, 36p. 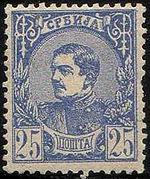 Wikimedia Commons has media related to Stamps of Serbia. Wikimedia Commons has media related to Postmarks of Serbia.